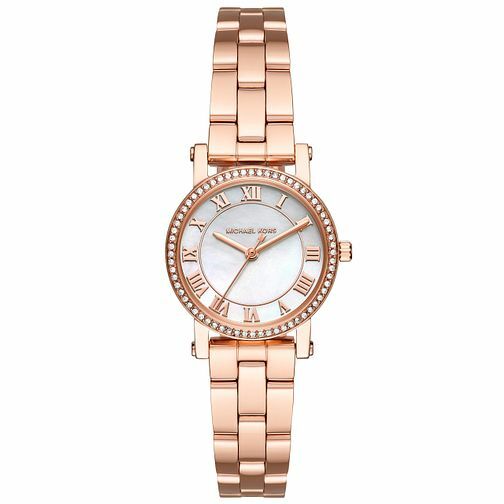 From the Michael Kors collection, this timepiece features a rose gold tone bracelet, and a sumptuous mother of pearl dial highlighted with a stone set bezel. Finished with rose gold tone Roman numerals and hands, this distinctive timepiece offers elegance for any occasion. Michael Kors Ladies' Rose Gold Tone Bracelet Watch is rated 4.8 out of 5 by 4. Rated 4 out of 5 by Anonymous from Excellent watch I purchased the watch online without viewing it first as a Christmas present for my girlfriend, when I collected it from the local Ernest Jones it was packaged excellantly and was a quality product.